This 2.5-inch display will show you an image of a generic car and will Interpret what’s is in front or behind you on the image of the car. The screen has a 2.5-inch viewable area and will work flawlessly in day or night. This sensor system can come with 4 or 8 sensors. When you put your vehicle in reverse the speaker built into the 2.5-inch display will start to beep when there is an object 8ft away and the closer you get to the object the beeping will get faster and faster until it “flatlines” 1ft away from your bumper with a solid beep. The TadiBrothers radar technology had been used on the road for over 10 years from a small Ford Focus to large semi-trailers, we keep everyone safe. When designing these displays we had the esthetics of your vehicle in mind, we made it elegant enough that you can display it anywhere in your vehicle some customers have even velcroed it to their dash consul to make it more intuitive for users. 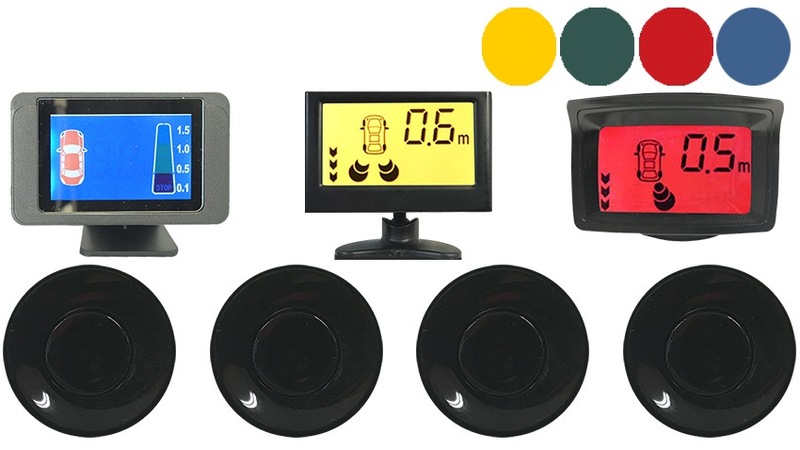 Includes all the above features but boast a larger screen with even higher resolution with brighter colors making it perfect for daytime or nighttime use (even in direct sunlight) it also comes in a heavy duty case making it our most durable parking sensor system available. You get 4 sensors and a display along with enough cable for even the longest SUVs. Very easy to install and it comes with everything needed. You can also expand this system to the front of your car.